Lamp Making & Lighting Kits for Crafts, Hobbies, Woodworking, Manufacturing, etc. Kits contain all the parts needed to illuminate your craft projects. Available with both candelabra and Edison base sockets. Large quantity discount pricing is available. LIGHTING KITS for SMALL Objects. With candelabra socket, choice of bulbs and cord. Cord exits from bottom of socket. with 25W & 40W Tubular Bulbs & Medium Edison Style Sockets. Cords Exit from the BOTTOM of Socket. Country-Style Accent Lamps that are lit from INSIDE the jar. Wine Bottle Hanging Lamp Kits easily convert your wine bottles into novel pendant lighting. 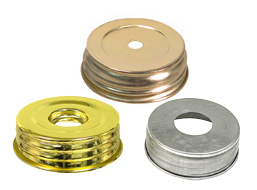 Beer Growler LAMP KITS are pre-wired and ready to install on your Beer Growler or similar container with 38mm cap. 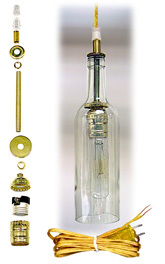 LAMP MAKING KITS with Medium Edison Style Sockets. Most Kits are PRE-WIRED & Ready to Install in your Project. Fits #2 oil lamps or similar. Cord exits from SIDE of Socket. Burner holds 3" dia. chimney (not included). NOTE: Length of bent portion is approx. 4-1/2" from bend to top of pipe. Easy Assembly. Place sockets and on/off switch anywhere you like along power cord. Includes five 7-1/2W transparent COLOR BLINKING BULBS. Assembly instructions included. A) Lighting Kit for Classic Ceramic Lighthouses & Similar Uses. 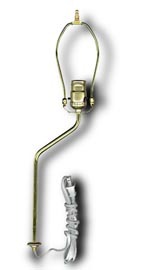 Has clip-in socket with 6" leads & place-anywhere socket. 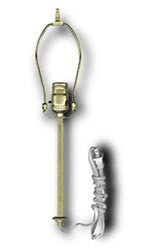 6'L light beige lamp cord has molded plug, in-line on/off switch & stripped ends. 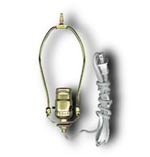 Has 4W clear bulb & a clear flasher bulb.